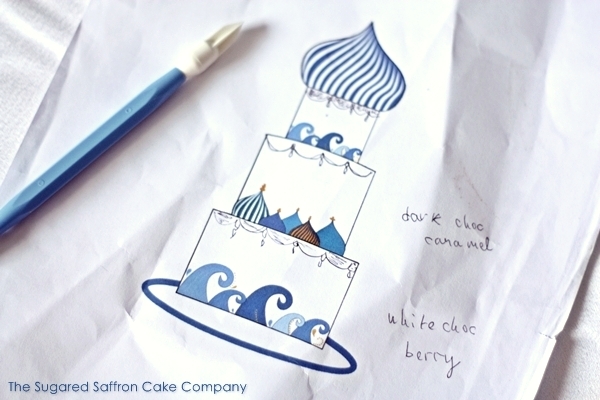 The last cake of 2012 had a Russian, nautical theme. The beautiful bride was Russian and both her and her new husband are both keen sailors. Their wedding cermeony was even close to the River Thames! I drew up the sketch on the computer and let her make any corrections or modifications at the consultation. She added the swag piping and gold detailing which made it even more regal. The top and bottom tiers were Vanilla bean cake with berry Italian meringue and the middle tier was dark chocolate with a caramel Italian buttercream. 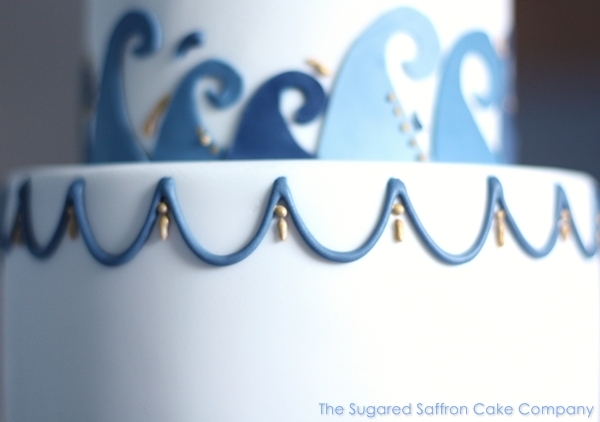 The swags are piped by hand with Royal icing I coloured with a navy paste. I don’t use any markers for the length or width like pin marks, I’m pretty good at guestimating. 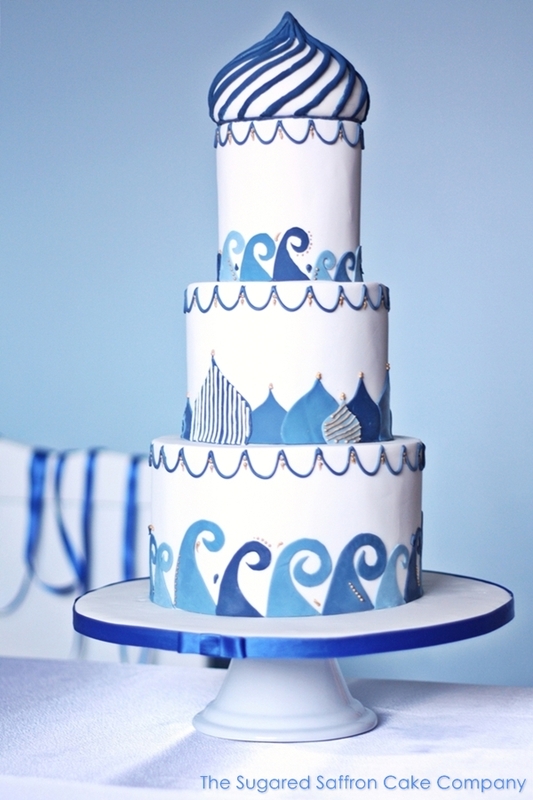 Now that I’ve said that, I’ll probably have a piping disaster *roll eyes*. I also cut the waves and mini Russian domes by hand. 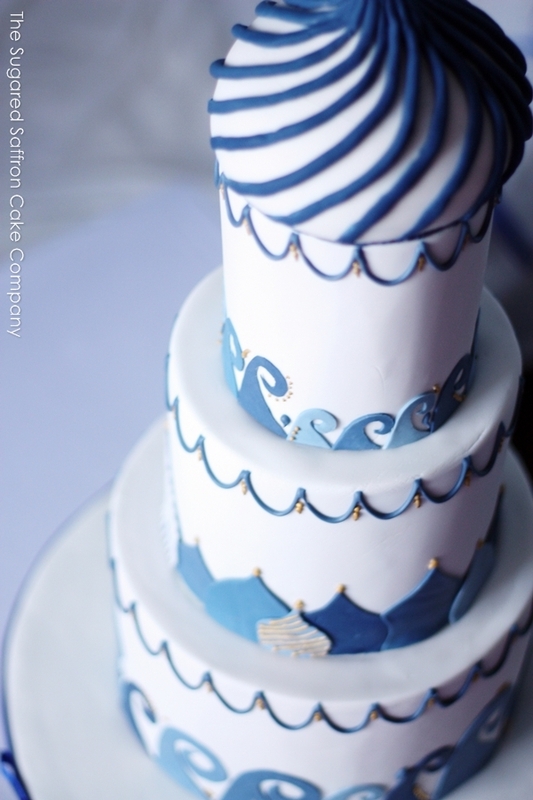 It was pretty handy in this case to have a blue bedroom, totally suited the cake! This is probably my favourite of the year, for a good few reasons. One of which is that it’s the first I did (mostly) alone in my make shift work room, and another is that it has a strong identity. We all love downloading cake photos off the internet or cut them out of magazines *cough pinterest, cough*. It’s also nice to have an imaginitive bride, who’s not afraid of being different, to think up some original ideas and get me to turn them into a cake. Its work like this that I really love. Hi Pia, I used imagescape, but any vector programme would work. Next PostTruffles. What to do with left over ganache.